Cleaning your windows takes you a too much time and exhausts you? You can do something different now – simply contact our representatives and book our window cleaning in East India Dock Road. We will manage this chore for you and the results will be ideal for each part of your windows – glass surfaces, framework and ledges. With our support, you will have the opportunity to do whatever you like with the time you for the most part spend for window cleaning. But our services will give you even more, as you can notice from our list of benefits. We use progressive techniques of window cleaning to make sure you will have great end results. With the water fed pole system, jet washing and rope access team, you can be sure that your property's glass surfaces will be spotless. In addition, your home is in good hands – the cleaners are fully insured and carefully trained. Our water fed poles are connected to water supply tanks, while our rope access ensures safety – even when we clean high-rise buildings. You can benefit from these methods today – dial 020 3746 3113! You can be certain that the good look of your business property is granted. The specialists will will fulfil your need of top-notch commercial window cleaning. With the help of our water-fed extension pole system, you will get quick and perfect washing of all windows up to the fourth floor. For taller buildings, we proceed with our rope access gears. It is our next-generation way of reaching glass panes on taller edifices. It doesn't matter what is the size of your property – a humble corner shop or the Shard – we will leave a perfect look of your windows. You can count on the abilities and competence of the experts for cleaning all kinds of windows. The glass surfaces in our proficiency are: single or double windows, sash ones and bay windows. Of course, if you have French doors, garden windows, greenhouse or roof windows, we will make them spotless, too. With our progressive techniques and latest machinery, we can cope with all types of window cleaning, even with hard-to-reach glass panes. 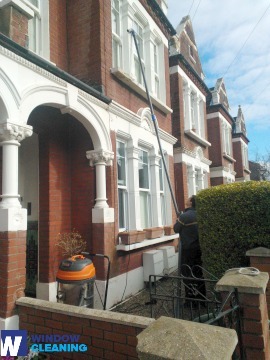 With our quick and excellent domestic window cleaning in East India Dock Road, you will boost the look of your home at once. We employ purified water for inside and out cleaning of your windows. We make this possible by using ground based water-fed extension pole system, which is safe both for your dwelling and the cleaners. Get more information – call us on 020 3746 3113 or fill in our online booking form. Otherwise, use our chat facility. Our operators are available 24/7 – you will get answers to your questions. You can be one of our satisfied customers today! The nearest tube station serving E14 East India Dock Road is South Quay.